I came down to breakfast and found a seat with Lisa. I sat down with her on a whim... since she was alone at a big table. After sitting and chatting a bit I realized that I read her blog. When I got home I realized that I also follow her on Twitter, and am friends with her on Facebook. It is still amazing to me that in crowds of over 2000 people you could randomly run into someone you "knew". The day 2 keynote featured the International Activist Scholarship Recipients. I cannot begin to do justice to what these women had to say. Amazing women. Just to give you an idea of what they blog through... we were not aloud to take photos or video, because if the images of the women made it to the internet... their identities could be discovered and their lives... and the lives of their families and friends could be at huge risk. If you have the time you might want to go read the transcript of the Morning Keynote. I attended the morning session "Where's the Line of the Lie: Storytelling, Memoir and Poetic License." Jory Des Jardins moderated the session with Jenny Lawson and Julie Marsh. I went mostly to hear Jenny. I just think she's hysterical. The last session I attended was called "Grief, Loss, Tragedy and Community on the Internet". Sounds like a cheery topic, right? I had been following all of the panelists at some time or another... and I was so interested to hear them all speak. This session panel - Cecily Kellogg, Loralee Choate, Kim Trimble, and Peter and Anissa Mayhew. I will admit I cried a little... and I laughed a lot. Let me just tell you (and it will sound wrong to say this) this session was HYSTERICAL. I happened upon a "dance off" between Mom-101, Motherhood Uncensored, Amalah and Her Bad Mother. I ended the "conference" portion of the weekend with the Closing Keynote. The photo everyone seems to have taken at BlogHer. 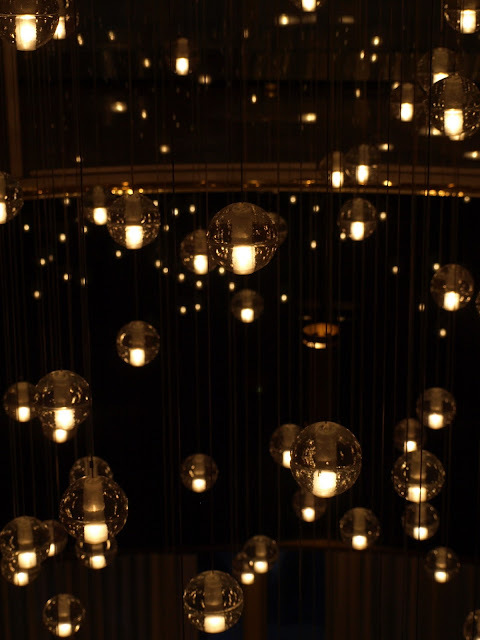 I have seen more photos of this light fixture than I can count. But... it was rather magical. It will seem ridiculous... but I tried all weekend to get a decent photo of what the light fixture in our hotel room bathroom did to your eyes. The light was a full frame around the mirror... and it reflected this odd square around the pupils in your eyes. It was slightly creepy. (Click the picture... go ahead... click it!) Somebody else please tell me you had bathroom light issues. 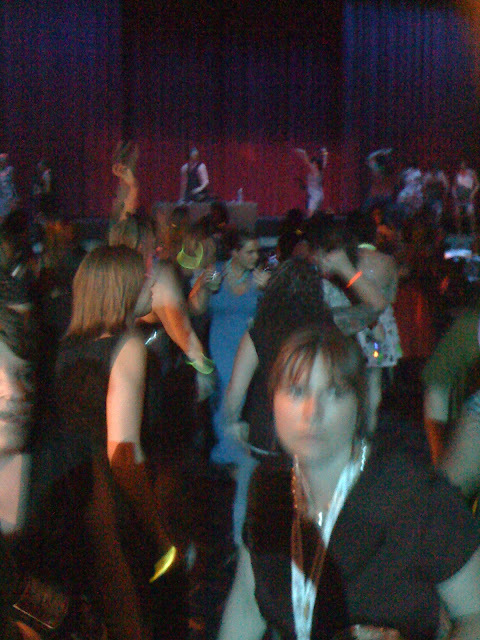 I ended my BlogHer experience the way you're supposed to... partying the night away. 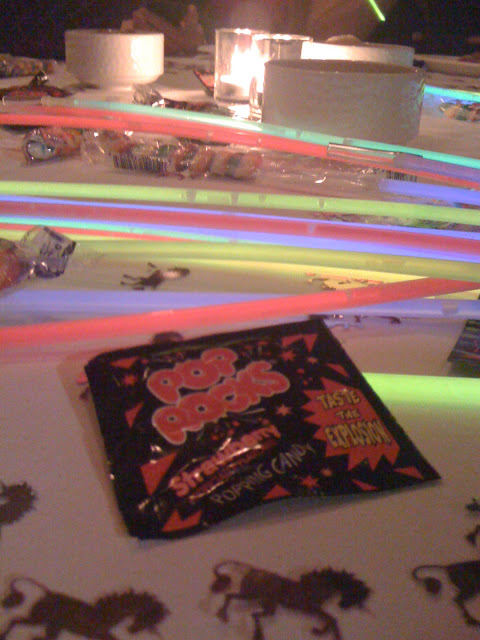 I don't think my weekend would have been complete without attending Sparklecorn (the MamaPop party). From everything I had heard... it was the "must attend event". They didn't disappoint. The cake was made by Charm City Cakes( you know... Ace of Cakes). The tables sparkled and popped. The dance floor never stopped moving. I danced the night away with my bloggy internet friends. Oh. And... yes... I also went to CheeseburgHer and wore a bag on my head (briefly). There was much dancing... and cheeseburger eating. 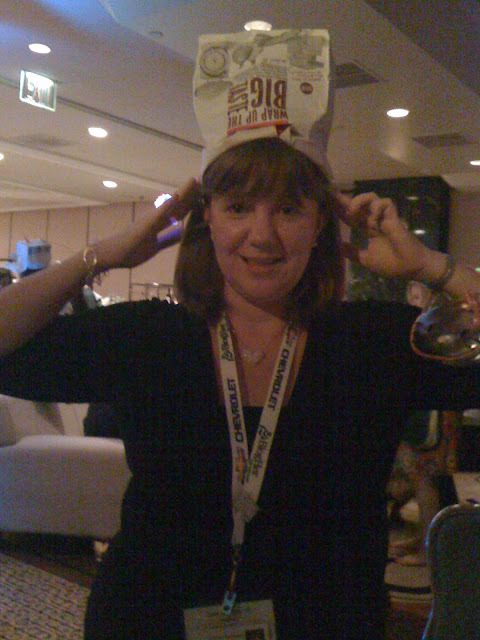 I seriously don't think BlogHer would have been complete without this photo. So there you have it. My last BlogHer post. Until next year. When I convince Nick I should go to the conference in San Diego.